Probably one of the most beloved stories in our memories from our childhood is the story of Noah’s Ark. It is a popular story for children because it is simple, understandable and has a great message. By itself it is a great story. It becomes even more exciting and meaningful when seen as a picture of the promised Redeemer in the Bible. The Bible says that the time of Noah was a wicked time. God saw the evil thoughts of man’s heart were steering him away from God. The times were so evil that God said He would destroy man from the earth. But then God thought about Noah. Because Noah loved God and sought to obey Him, God knew that Noah could be used to preach repentance to the people and to build an ark (a large ship) to save those who would trust God. In Genesis 6:8 the Bible says that Noah found grace in the sight of God. It becomes even more exciting and meaningful when seen as a picture of the promised Redeemer in the Bible. Noah had three sons with three daughters-in-law. Along with his wife they were a family of eight people. In the end of the story we find that these eight people are all that were saved and were called upon to replenish the earth. Noah’s three sons were named Shem, Ham and Japheth. God instructed Noah to build a large boat which He would use to preserve life on the earth. God brought the animals to Noah. The clean animals would come into the ark in groups of seven (Genesis 7:2) and the unclean animals would come two at a time (Genesis 6:20). The structure of the boat was explained by God. He told Noah what type of wood to use and how large the ark would be. This was given in a measurement called a “cubit.” Though there are various lengths called a cubit, it is about 18” (about 45 centimeters) in length. 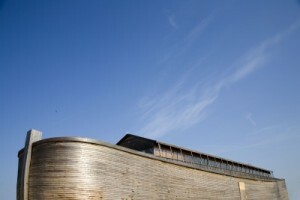 That means the ark was about 450 feet long (135 meters) and 45 feet wide (22.5 meters). The height of the ark was 45 feet (13.5 meters) and it was divided into three levels. We don’t know exactly how many years it took Noah to build the ark, but piecing together some of the ages and dates given between Genesis 5 and Genesis 11, it seems that Noah built the ark and preached for at least 55 years to as many as 120 years before the flood started. The popular number of 120 years comes from Genesis 6:3 when God said that man’s days would be 120 years. He was 600 years old when he entered the ark. Noah and his family entered the ark alone as there was no one else who joined them. They waited in the ark 7 days before the flood began. The Bible says in Genesis 7:12 and 17 that it rained actively for 40 days. The earth was flooded 150 days, or almost 6 months. The flood stopped and the waters began to recede. After 150 days at sea the ark settled onto Mount Ararat. Noah released a couple of different birds to help him know if it was possible to leave the ark. The first was a raven that left and returned continuously until the waters receded. Then he released a dove. The dove, which he sent out three times, did not have any place to rest the first time it was released. It returned to the ark. Seven days later he sent the dove again, but this time it brought back an olive branch. Another week later Noah sent out that dove again, but it never returned. This told Noah that it was time to leave the ark since there was proof of vegetation and dry ground. Noah and his children released the animals from the ark. When they exited the ark they built an altar to the Lord (Genesis 8:20). God promised to Noah that He would never destroy the earth again with a flood. As a token of His promise He made the rainbow. Even though the rainbow is a natural phenomenon today, it must be remembered that it had never rained before this event. God watered the earth with water from beneath. There was never a chance before the flood for there to have ever been a rainbow. It is easy to see the comparison with Jesus Christ as the Redeemer. In Noah’s day people were called to turn from their sins and return to God. When they refused to enter the ark (a sign of trusting God’s Word), they were destroyed in the flood. Today, we are called to repent of our sins and accept Christ as our Savior. Those who have not accepted the Lord will be lost to a Christ-less eternity. Have you accepted the salvation available in Christ? Although I’m probably no longer considered a kid (at 55, maybe a kid at heart), I still find the story of Noah and the Ark fascinating. Wonderful article you’ve written. You make a great point about the comparison between Noah’s Ark and salvation through Jesus. Those who have hidden their lives in Christ do not have to fear the coming judgment. And, like Noah, we must spread the message to a lost humanity. God bless you, David. Thank you for your kind words Robert. I love telling these great stories. Noah’s ark has always been one of my favorite Bible stories. I think there are so many lessons packed in this story about the human condition. I also find it interesting that there are so many major flood stories told in the ancient world. It makes you wonder if they are all related somehow and tell the same story through their respective cultures. Hi David, I should realy like to know what you can comment on what a very highly educated – Professor – in South Africa said on a local radiostasion, that the story of Noah and the ark is only a myth and it is not possible that only 8 people could look after such a lot of animal in such a small space, how could they keep the ark clean, etc. I was very upset about it and wrote a letter to the radiostation to remember that guy that it was the Almighty God who created the heaven and earth who was handling the whole situation. The 8th day the ark of god Christ will take Abrahams seed back to a day the earth will spring up not rain down to plenish the earth again when god becomes the high priest again as he was Adam and eves priest he will assume that position again as no devil will b here ever again god will put himself n those folks as he wanted to do for Adam and eve but lucifer got n the way with self was close to god and got exalted he was made of flesh and couldnt handle it we need a new body to dew this huh praise the lord want to go thru the BLOOD! Another insightful article! Finally~ I now comprehend the co-relation between Noah & the flood and gaining salvation through Jesus. It just didn’t ‘sink in’ ’til I read your article here. Thank you! I tried to explain this RAINBOW being the FIRST, and we now know the scientific explanations what creates a rainbow, etc., Gary says it’s not written as such in the Bible. He intends to ask our Pastor Don Brown at the next Bible study class. God’s wonderful blessings & His graces be showered upon you, David, and your family!